Checkout with this coupon code at 8Seasons to save $10 off your orders of $99+. Save $5 off $49+ with this coupon code from 8Seasons. Shop sale at 8Seasons to save up to 80% off top products. Save $18 off your order of $199+ with this coupon code from 8Seasons. Use this code to save $36 off your order of $499+ from 8Seasons. 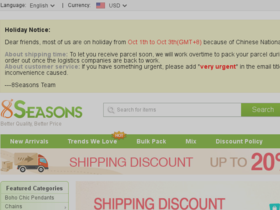 Act now and enjoy a 20% discount on shipping when you shop at 8Seasons.com. Check out 8Seasons online for their latest special offers.